The Internet has brought tremendous power to small business owners, especially over the past few years. Not only is there ever increasing access to potential customers, but small business owners also have access to affordable tools to supercharge their marketing efforts. One of my favorite marketing tactics for small businesses is a good sweepstakes! Sweepstakes are a special type of contest where many people may enter and a product/service is randomly given away at the end. I have seen sweepstakes run in many different ways, such as: one or multiple products, one or many winners, 1 entry or multiple entries (usually if the person completes an extra action). Sweepstakes are a very effective way to grow your fan base as you can require that someone can only enter your contest after they have liked your social media page and/or signed up to your email list. You have the option of giving away anything you want, although I would suggest that you give away something industry related. For example, if you are a photographer, I would suggest giving away a free photo shoot and some free prints. Why, you ask? Well, I used to work with a hearing specialist company who gave away iPads for their sweepstakes. Sure, they received a ton of followers and subscribers, but very few of them were not interested in their product or service. How Do I Actually Run a Sweepstakes? While it is possible to run a sweepstakes with good old paper and pen, the Internet allows you to leverage technology to easily run an effective sweepstakes with social networks such as Facebook and Twitter. As a matter of fact, Facebook’s TOS require that you administer sweepstakes through an app. Now, I’m going to assume that you are not a programmer and that you have no idea how to create an app to handle a sweepstakes. With those guidelines, I’m going to recommend two social contest app providers and let you choose between them. Wildfire was one of the first players in the social marketing game, and they are arguably the most popular. Wildfire is used by some of the biggest brand names out there, including Sony, Amazon, and Universal Studios. Because of this, Wildfire is also one of the most expensive solutions out there at $35-100 for the lower plans. If you’ve got quite a bit of extra cash, then Wildfire may be the way to go. 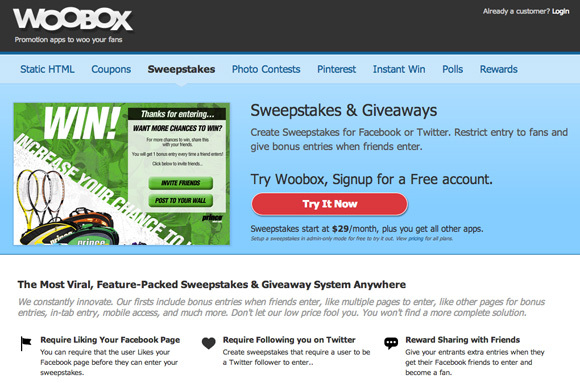 The sweepstakes app provided by Woobox can also be embedded in your company website and can require liking your Facebook page and following your company on Twitter. And, you can also export all entries into your email marketing service, like GetResponse, so that you maintain the data. And all of this costs anything from $0 – $249, based on the number of followers your Facebook fan page has. This is a very affordable solution that all small businesses can take advantage of. Promotions are a very simple way to put your business in front of prospective customers as well as build loyalty with current customers. Leveraging the power of the internet will allow you to reach many more customers as well as easily manage your sweepstakes. After reading this article, how excited are you about running a promotion? Do you plan on running your own promotion? Let us know by leaving a comment below! This post was written by Eric Binnion. When Eric is not online, he is usually volunteering in his community or enjoying time with his family. You can find Eric on Twitter. 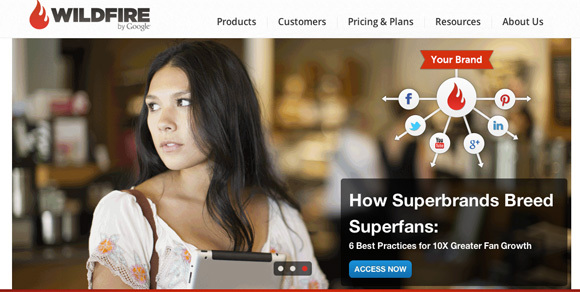 Make more money with actionable no-nonsense marketing tips. Sign-up below and immediately receive our 5 part blog marketing crash course.